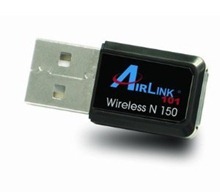 Extend the range of your current Airlink101 or other wireless network with new Wireless 150 N Mini USB Adapter. It is the smallest wireless USB adpater. Simply press the Easy Setup Button to connect to your encrypted wireless network without any setup hassle! AWLL5077 Wireless Mini USB Adapter is great for environments with the need for higher wireless data traffic. This USB adapter is fully backward compatible with 802.11b/g and RoHS compliant. When downloading files, choose "save to disk" instead of "open". We recommend saving the files to your desktop to make the job of locating downloaded files easier.